The Poppies restored an 11-point advantage over second-placed Stourbridge as their 2-0 home success over St Neots Town last Saturday was coupled by the Glassboys’ 3-2 defeat at Royston Town. With just six games remaining, Kettering now know that three more wins will guarantee them the crown. 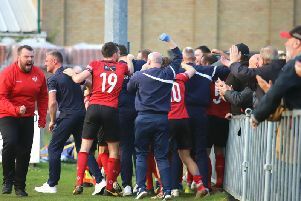 But should they be victorious in Suffolk tomorrow (Saturday) then it will present them with an opportunity, albeit dependent on other results, to claim the title and promotion if they were to beat play-off chasing Alvechurch at Latimer Park next weekend. The calculators are at the ready and the countdown now appears to be on. And while Law would love nothing more than to see his side get that win and set up a big day at Latimer Park, his full focus is now on ensuring his players don’t take anything for granted. “Our result last weekend and the results around us give us confidence,” Law said. “But you can’t rest on your laurels and you can’t take any opposition for granted. “I have been in this position before and your opponents are always quietly motivated to hinder your quest of being a title-winning side. “So it will be very tough for us on Saturday and I just want us to win. “I want us to win because it will mean we will be just a couple of games away. The Poppies will be boosted by the return of experienced striker Aaron O’Connor this weekend. The frontman, who has scored 10 goals this season, is available again following a three-match ban after he was sent-off in the 1-0 win at Lowestoft Town at the beginning of March. “Aaron will automatically go into the squad, of course,” Law added. “And then we will make the right decisions for him and for us when it comes to team selection. Adam Cunnington, meanwhile, has left Kettering and re-signed for his former club Billericay Town. The striker returned to the Poppies in December and scored one goal during his spell when he netted in the 2-1 success at Bedworth United on Boxing Day. But his whereabouts had caused confusion after he was withdrawn at half-time during the 2-1 victory over Rushall Olympic at the end of last month. 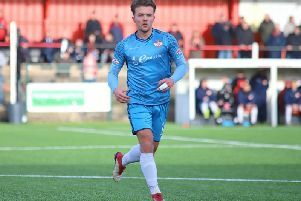 However, his return to the Vanarama National League South club was confirmed yesterday and a statement released by the Poppies said: "As many of you will have seen, Adam Cunnington has re-signed for Billericay Town. "With the season drawing to an end, Adam understandably wanted consistent first team football, which was proving difficult with the Poppies. "Adam’s time with us may have been short and his appearances limited but we are sure our fans will join us in thanking him for his contributions and wish him well for the rest of this season and those ahead."